Firefly’s silent hybrid power systems reduce the runtime of diesel generators, delivering a reduction in noise, diesel fuel consumption, CO2, NOx and PM emissions. Construction occupies a unique position in society. It shapes where we live and work, contributes to GDP and is a major employer. The importance of sustainable economic, social and environmental development is now firmly at the top of the agenda for many in the industry. Sustainability is at the heart of the future of construction including supply chain, skills development, innovation, long term planning and productivity. New technology offers significant benefits to the construction sector to achieve these major objectives. Combining innovative products with smart data enables contractors to not only deliver the needs for improved environmental performance but to report these findings as part of wider regulatory requirements such as ESOS (Energy Savings Opportunity Scheme). Development can create disruption to residents, workers and wider community amenities. The Considerate Constructors Scheme has become the benchmark standard to track and demonstrate commitment to reducing this disruption. Firefly is a registered supplier to the Considerate Constructors Scheme, and is working with many contractors to deliver reduce noise and local environmental pollution – often the cause of complaints from neighbours and local authority enforcement teams. The construction industry is responding to the challenges to reduce CO2 emissions both embedded with the final project but also as a result of the building phase. Firefly has worked closely with the plant hire and construction sector to develop a robust, rental specification hybrid power system that meets the needs of a diverse and important industry. Firefly’s Cygnus® range has been used in a variety of building projects across the UK and Europe, and is now established as the leading supplier of temporary hybrid power systems to the construction sector. Site power needs change over the course of the working day. At night or on weekends loads are invariably much lower, leading to diesel generators running inefficiently. Hybrid power systems provide an immediate and effective solution to improve efficient diesel generator use. By using either the in-built timer function or by running the Cygnus® in automatic load sensing mode, diesel generator run time is reduced. Cygnus® ensures that the most efficient energy source is used at all times on site, and that site power needs are always met as load fluctuates throughout the day. Diesel generators run more efficiently, using spare capacity to charge the hybrid’s energy storage. Reducing diesel generator run time by using a hybrid power system reduces pollution and noise. Particularly overnight and at weekends when a site power is usually very low, noise is frequently a problem. 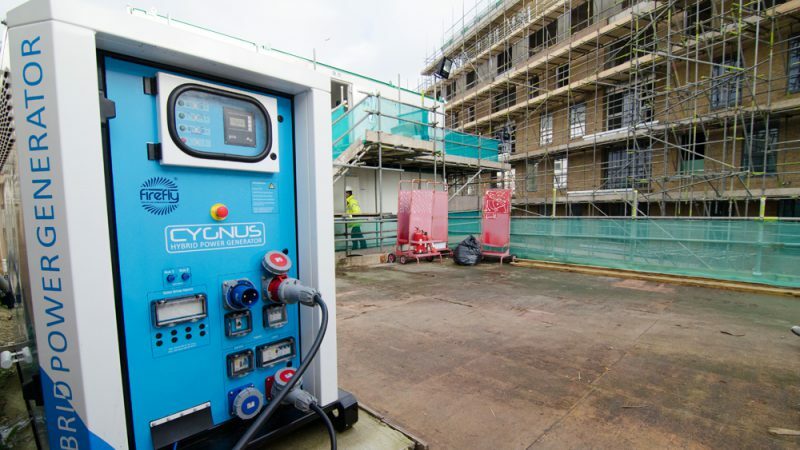 The Cygnus® range includes a timer function that allows the site operator to ensure that critical power systems are maintained, whilst eliminating noise and improving the local environment for the local community. NOx and PMs have a direct impact on local air quality and are linked to health concerns. Hybrid power not only ensures that these are completely eliminated during anti-social times of the day; but also ensures that a diesel generator runs more efficiently, and therefore reduces overall NOx and PMs. In city centre locations access to site for deliveries can be limited to certain times of days or can be restricted due to project considerations. Hybrid power will reduce the number of fuel deliveries and service visits for a diesel generator, as a result of reduced generator run time. A variety of security measures are often required on site, not only for protecting high value assets, but also to improve public health and safety. Perimeter or access lighting, CCTV, alarms and security guard facilities are required 24 hours a day. Hybrid provides this power continuously not only silently but also ensures better up time, in the event of a diesel generator breakdown. In more remote locations fuel replenishment and service calls can be an additional cost to operations. Reducing generator run time with hybrid power can deliver additional cost savings. Generator breakdown can go undetected on remote sites. Remote monitoring and diagnostics via GLOW RFM® can also improve response times and hybrid provides a secondary offline UPS to maintain critical power applications. Reduced pollution, noise, fewer vehicle movements, on-site refuelling and fewer service calls inherently improve the overall site risk profile. Staff, as with the local community, will benefit from lower pollution and noise levels. Offline UPS functionality of Cygnus® also means that critical lighting, heating and welfare services can be maintained. For example, during night works on a major highway, a service engineer may take a few hours to respond to a breakdown, but Cygnus® can maintain power to ensure that staff can move to a safe location in the meantime. Fleet operators have full instant access to Cygnus® hybrid units through the GLOW RFM® cloud platform. Remote system performance and diagnostics significantly improve power system uptime, and ensures that site call outs are efficiently managed as faults are proactively managed ahead of arrival. CO2 reporting is well established across the industry, but is generally a long-winded exercise which involves information from a wide range of data sources including electricity meter readings, fuel bills and so on. GLOW RFM® provides site level reporting that can be aggregated to show fuel and CO2 savings based on user defined time frames. Summary reports are presentation ready at the touch of a button.